National Building Museum Restoration | John Canning & Co. Built after the Civil War as the Pension Bureau, Canning Co. artisans implemented a 5-step marbling finish on the massive Great Hall columns. 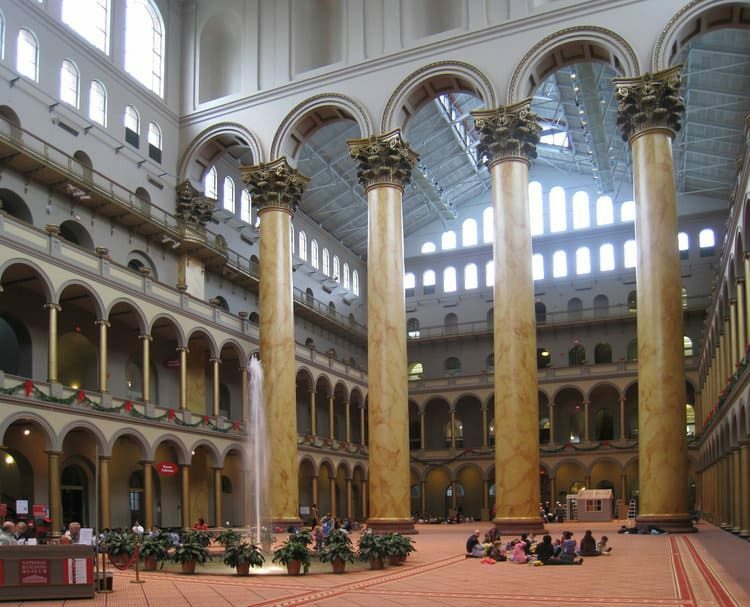 A suspended scaffold system was used allowing the National Building Museum to remain open to the public. Canning Co. prepared large-scale mock-ups to develop color, vein, and historic accuracy of the faux marble finish. The ‘look’ was inspired by the classic renaissance columns of Michelangelo’s church of Santa Maria delgli Angeli in Rome. Work on the eight, 75-foot columns, among the largest Corinthian columns in the world, was carried out in a five-step process from a suspended scaffold system. All materials were selected to conform with AIC standards of permanency and reversibility. Each column was built with 70,000 bricks, framed and covered with smooth plaster. They were painted ot resemble marble in 1895.